Getting enough protein is important for health. For this reason, the Recommended Daily Intake (RDI) for protein is 50 grams per day. However, some researchers believe that many people should be eating significantly more than this amount (1). A high protein intake can help with weight loss, increase muscle mass and improve health, to name a few. Here are 14 easy ways to eat more protein. When eating a meal, eat the protein source first, especially before you get to the starches. Protein increases the production of PYY, a gut hormone that makes you feel full and satisfied (2). In addition, a high protein intake decreases levels of the “hunger hormone” ghrelin and increases your metabolic rate after eating and during sleep (3, 4). What’s more, eating protein first can help keep your blood sugar and insulin levels from rising too high after a meal. In a small study, people with type 2 diabetes were served identical meals on different days. Blood sugar and insulin rose significantly less when they consumed protein and vegetables before high-carb foods, compared to when the order was reversed (5). Bottom Line: Eating protein first at meals can help you feel full and keep blood sugar and insulin levels from rising too high. Snacks are a good way to get extra protein into your diet, as long as you choose the right types. Many common snack foods are very low in protein, such as chips, pretzels and crackers. For example, a 28-gram (1-oz) serving of tortilla chips has 137 calories but only 2 grams of protein (6). In contrast, the same amount of cheddar cheese contains 7 grams of protein, along with 20 fewer calories and 4 times as much calcium (7). Additionally, cheese doesn’t seem to raise cholesterol levels much, even in people with high cholesterol. In fact, cheese may even benefit heart health (8, 9). Bottom Line: Choose cheese for a filling snack that’s high in protein and calcium and may also improve heart health. Many breakfast foods are low in protein, including toast, bagels and cereals. Although oatmeal contains more protein than most cereals, it still only provides about 6 grams in a typical 1-cup serving (10). On the other hand, three large eggs provide 19 grams of high-quality protein, along with important nutrients like selenium and choline (11). 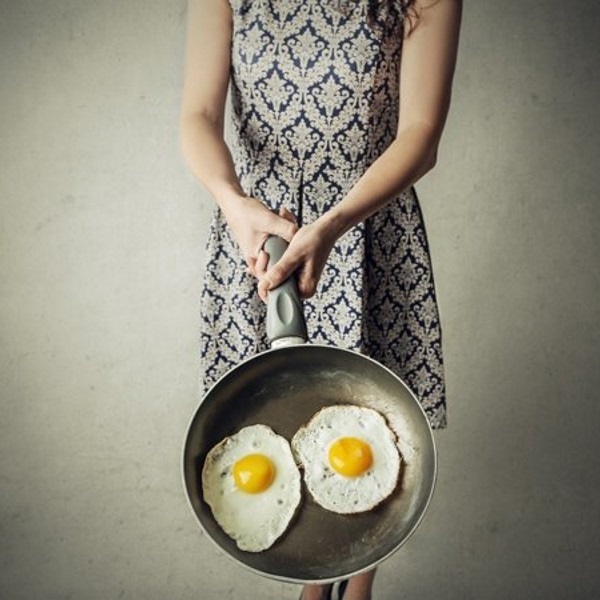 What’s more, several studies have shown that eating eggs for breakfast reduces appetite and keeps you full for several hours, so you end up eating fewer calories later in the day (12, 13, 14). Eating whole eggs can also modify the size and shape of your LDL (“bad”) cholesterol particles in a way that may decrease heart disease risk (15). Bottom Line: Replacing cereal with eggs boosts protein consumption, makes you feel more full and helps you eat fewer calories. They’re high in magnesium, fiber and heart-healthy monounsaturated fat, yet low in digestible carbs. Almonds also contain 6 grams of protein in a 28-gram (1-oz) serving, which makes them a better source than most nuts (16). And although a serving of almonds contains around 167 calories, studies have shown that your body actually absorbs only about 129 of those calories because some of the fat isn’t digested (17, 18, 19). So sprinkle a few tablespoons of chopped almonds over yogurt, cottage cheese, salads or oatmeal to increase your protein intake and add flavor and crunch. Bottom Line: Almonds are high in several nutrients and can boost the protein content of a meal or snack. Greek yogurt is a versatile, high-protein food. A 240-gram (8-oz) serving provides 17–20 grams of protein, depending on the brand. This is about twice the amount in traditional yogurt (20, 21). Greek yogurt is made by removing whey and other liquids to produce a richer, creamier yogurt. Research shows Greek yogurt increases the release of the gut hormones GLP-1 and PYY, which reduce hunger and make you feel full (22). In addition, it contains conjugated linoleic acid (CLA), which has been shown to promote fat loss in some studies (23, 24). Greek yogurt has a tangy flavor that goes well with berries or chopped fruit. It can also be used as a substitute for sour cream in dips, sauces and other recipes. Bottom Line: Greek yogurt contains twice as much protein as traditional yogurt and can be eaten alone or added to other foods. Salads are loaded with vegetables that provide vitamins, minerals and antioxidants that help protect you from disease. However, they often contain only a few grams of protein, which will likely lead to hunger after an hour or two. Chicken or turkey breast: 30 grams. If you’re looking for a good plant-based option, garbanzo beans (chickpeas) are a great choice that provides 15 grams of protein per cup (165 grams). Bottom Line: Topping your salad with poultry, cheese, fish or legumes will help you meet your protein needs and stay full and satisfied. A shake or smoothie can be a great breakfast, depending on the ingredients. Many smoothies contain a lot of fruit, vegetables or juice, but little protein. Protein powders make it easy to create a high-protein shake. There are several types on the market, including whey, soy, egg and pea protein. Whey protein powder has been studied the most and seems to have an edge over the others when it comes to helping you feel full (25, 26, 27). One scoop (28 grams) of whey powder provides about 20 grams of protein, on average (28). Here is a basic whey shake recipe. To boost the protein content even more, use more protein powder or add peanut butter, almond butter, flaxseeds or chia seeds. 8 oz (225 grams) unsweetened almond milk. 1 scoop of whey powder. Stevia or another healthy sweetener, if desired. Bottom Line: Having a protein shake for breakfast helps you start the day off right. Whey may be the best type to use. When it comes to protein, it’s not just the total amount you take in every day that matters. Getting enough at each meal is also important. Several researchers recommend consuming a minimum of 20–30 grams of protein at each meal. Studies show that this amount promotes fullness and preserves muscle mass better than smaller amounts eaten throughout the day (29, 30). Select foods from this list of delicious high-protein foods in order to make sure you meet your needs at every meal. Bottom Line: Include a high-protein food at each meal to get what you need to feel full and maintain muscle mass. Selecting leaner cuts of meat and increasing portion sizes slightly can significantly boost the protein content of your meal. Ribeye steak (fatty): 18 g protein and 274 calories per 100 g (3.5 oz) (31). Top sirloin steak (lean): 24 g protein and 225 calories per 112 g (4 oz) (32). Bottom Line: Choosing leaner cuts of meat and slightly larger portions is an easy way to increase your protein intake. Fruit is rich in antioxidants, nutrients and fiber. However, it’s very low in protein. Peanut butter is a delicious, high-protein food with a creamy texture that complements firm fruits such as apples and pears. In fact, spreading 2 tablespoons of peanut butter on sliced fruit will boost the total protein content by 8 grams (33). What’s more, studies suggest that peanut butter may decrease appetite, reduce blood sugar levels and promote heart health (34, 35). Bottom Line: Add peanut butter to fruit to boost your protein intake. This can decrease appetite, improve heart health and lower blood sugar. Lean jerky is a convenient way to get more protein into your diet. However, it’s important to choose a healthy type. Many types of jerky contain sugar, preservatives and various questionable ingredients. They’re also frequently made from lower-quality meat. Some jerky and “snack sticks” come from grass-fed beef, bison and other free-range animals. Choosing jerky from grass-fed animals will provide better-quality meat with higher amounts of healthy omega-3 fats (36). Lean jerkies or snack sticks contain about 7 grams of protein per 28 grams (1 oz). They can often be stored for several months without refrigeration and are ideal for travel. Bottom Line: Lean jerkies and snack sticks are good sources of protein. Choose high-quality types that come from grass-fed animals. Cottage cheese is a tasty food that’s also very high in protein. A one-cup (225-gram) serving contains 25 grams of protein and 220 calories (37). A 2015 study found cottage cheese to be as filling and satisfying as eggs (38). What’s more, the full-fat type is a good source of CLA, which may promote fat loss and lead to improvements in body composition (23, 39). One study followed women who ate a high-protein, high-dairy diet while exercising and reducing calorie intake. They lost more belly fat and gained more muscle mass than women with moderate protein and dairy intake (39). Cottage cheese is delicious on its own. You can also try it with chopped nuts or seeds, cinnamon and stevia or another sweetener for a quick breakfast. Additionally, smaller amounts of cottage cheese make a great snack. Bottom Line: Cottage cheese is a versatile, high-protein food that makes you feel full and may help improve body composition. Edamame is the term for steamed soybeans in their unripened form. Soybeans have more protein than other legumes and are popular among vegetarians and vegans. One cup of edamame has 17 grams of protein and about 180 calories (40). Edamame is high in an antioxidant known as kaempferol. Studies on mice suggest it may reduce blood sugar and help with weight loss (41, 42). Edamame can be purchased fresh or frozen, and it makes a great snack. It can also be added to stir-fry recipes. Bottom Line: Edamame is a good source of plant protein and may also have other health benefits. Canned fish is a fantastic way to boost protein intake. It requires no refrigeration, so it’s wonderful for travel. It can be enjoyed as a snack or with a meal. Fatty fish like salmon, sardines, herring and mackerel are also excellent sources of omega-3 fatty acids, which can fight inflammation and improve heart health (43, 44, 45). A 100-gram (3.5-oz) serving of canned fish contains between 20–25 grams of protein and 150–200 calories. Ideas for serving canned fish include combining it with healthy mayo, serving it on top of a salad or eating it straight from the can. Bottom Line: Canned fish is a convenient source of high-quality protein and beneficial omega-3 fatty acids. Getting enough protein is very important. A high protein intake can help you lose weight and gain muscle, while improving your body composition and metabolic health. Fortunately, this is easy to do if you follow the simple tips above.